How to copy-translate-paste certain lines? Find what zone: Turn on the dispenser. Replace with zone: Quick! Power it now! … but maybe there was a portion of your requirements that you didn’t include, that requires you bookmark multiple lines through multiple confusing matches before you do one solid replace. It might be a good idea for you to more clearly define what you’re trying to achieve, with better example texts, and showing both “before” and “after” conditions… Embedding the text, so we can copy your actual text, is helpful. This FAQ shows some ways to embed text, and to embed the image so that it shows up in the post, rather than requiring us to click to another site. The last Peter's post, speaking about the command Search > Bookmark > Paste To (Replace) Bookmarked Lines helped me to think of a true advantage of this command. Indeed, let’s suppose we would like to search a great amount of text and replace it with, a great amount of text, too ! For instance, in the N++ license.txt file, using the Regular expression search mode, the regex (?s-i)TERMS AND CONDITIONS.+? (?=NO WARRANTY) will select all the TERMS AND CONDITIONS paragraph, with its 11 points ! When Marking (with bookmarking hits enabled) finds a match that spans lines, it will only bookmark the FIRST line of the match, so this technique may not allow full replacement of “a great amount of text” searched for. Arrrrgh, sorry, I’m really confused ! I confess that, when elaborating my previous post, I just verified that my regexes were correct, but, without even doing a mark test :-(( I would, certainly, have noticed that well-known fact ! On the other hand, if your regex identifies some specific lines in the scanned file(s), the Search > Bookmark > Paste to (Replace) Bookmarked Lines command allow you to replace each of those specific lines with the clipboard contents, which may have a consequent size ! Now, even if the Mark feature would have marked all the lines, matched in a Multi-lines search, the Search > Bookmark > Paste to (Replace) Bookmarked Lines command would have been useless, as every line marked would have been replaced with the clipboard contents ! Not the expected result, isn’t it !! But I’ve got an easy solution !! Don’t you see ?.. Yes, this works really well. 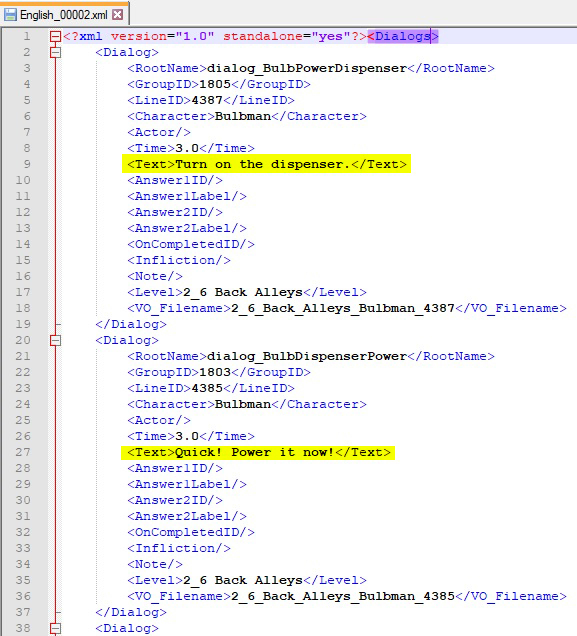 I need to replace many large blocks of text of variable size in a large xml file. This solution works well for me.